WHEN the Olive Press broke the story that MP Margaret Moran had improperly warned neighbours off her land with official House of Commons notepaper in 2006, we quickly received legal letters from her solicitors. Forced to retract the claim in the next edition, it came as a big surprise – and irritant – when months later a neighbour of her holiday home in Granada actually produced a copy of one such letter. It took great restraint not to run the story on our front page. Now, however, the Labour MP for Luton South has become embroiled in the murky MP expenses scandal, which last week led to her resignation. Already forced to hand back 22,500 euros wrongly claimed for dry rot at one of her three UK addresses, she is now in hot water over using House of Commons paper after a complaint was filed. It also emerged that she even claimed for the 900 euro bill from the leading libel lawyers, who she had used to sue the Olive Press – and UK newspapers the Mail on Sunday and Observer. 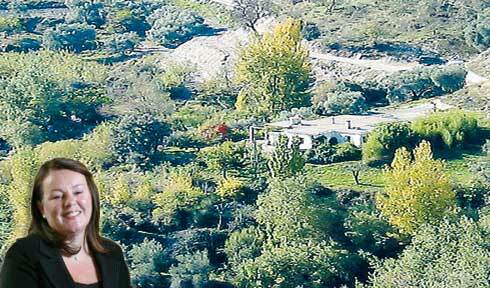 Last issue, we revealed how on top of the three second homes she owned in the UK, the socialist MP had made money renting out her four-bedroom villa in the Alpujarras. Today, we are proudly printing the letter she allegedly pinned to the gates of her farm, warning neighbours not to use paths to their homes that had been used for 20 years. The note – which was hastily scrawled – was “one of several” she allegedly wrote and used two years ago. Beatriz Moschopoulou, 56, who lives next door, said: “They were stuck on trees, on vehicles that had been parked on the path, and eventually on the gate that barred us from using the only track available to access our property. Meanwhile, Moran’s former estate manager Hagai Scharf confirmed that Moran had kept a big stack of House of Commons stationary in the house. “There were often big piles of the official notepaper that she used to use,” he told the Olive Press. Scharf, who organised her lettings and looked after the property for six years, continued: “I think she used them because she felt she was being ignored by all the neighbours, and wasn’t getting the respect she felt her position as a politician deserved. The Olive Press revealed in 2006 how Moran had illegally blocked off paths leading to the homes of a dozen neighbours near her farmhouse in Carataunas, near Orgiva. We explained how she had been denounced by the neighbours, who held protests outside her four-bedroom home, which was rented through agency Rustic Blue. Eventually a Judge ordered that the MP and her brother John, with whom she joint owned the house, had to reopen the paths. She lost an appeal. Since the scandal of the UK MPs expenses broke three weeks ago, Moran has been one of the worst culprits. As well as “flipping” her second homes to maximise the allowance, she allegedly used her staff and official House of Commons paper to help her husband’s company EQN get business. Under Commons rules office resources and staff are supposed to be used solely for Parliamentary duties. The MP, who had some of the highest expenses claims over the last ten years, claimed for 26,000 miles of travel expenses last year alone, or enough to get to her Luton constituency from Westminster over 407 times. She was ordered to appear in front of Labour’s specially set up Expenses panel last week amid calls for her resignation. Campaigning TV presenter Esther Rantzen has vowed to stand against Moran as an independent if she doesn’t resign before the next General Election. WHEN we broke the story of MP Margaret Moran’s disdain for centuries-old tracks through her land in 2006, we showed a distinctly non-socialist side to this Labour MP. Cutting off access roads to a dozen neighbours, she behaved “like an Imperialist from the days of the Raj,” said one local. And then there were the notes; the prodigious notes she scribbled to warn off neighbours. To keep them off her land, to remove their motorbikes, and to generally throw her weight around. Each apparently written on the classic House of Commons notepaper she had stacked up in the home. While she sued the Olive Press at the time for printing this fact, it now emerges she not only put the huge legal bill through as expenses, but she DID actually use the paper. We know this because we have a copy, which we proudly printed on last week’s front page. And what an appropriate symbol the portcullis at the top of the notepaper is. For last week, the portcullis finally fell on the checkered career of Margaret Moran, and not before time! because of the action she took via her solicitors!!!! Oops! I’ve just seen a pig fly past my window!!!!!! It is probably not the most flattering photo, she does look like the average hen party bimbo from banus, but next to the row on expenses, the article lacks any comments on achievements of the bimbo. Did she save jobs? Did she pick up the phone when the crisis happened? Crossing the line is bad but when done in the line of duty, it is different. Also the tone of this arricle is interesting. Often the brits in spain complain as if they come from a more civilised world. Yet it shows that the cultural gap is smaller than many people think. I think the OP has a bit of personal vendetta going on here, having been warned off by Carter Ruck earlier. Also, gossip from neighbours is just hearsay at the end of the day – I’ve no idea who said what in reality so really a waste of time printing. Sticking up post-it notes with the House of Commons stationary was madness, however. Of course, no word of her work as an MP was ever made – was she good, bad, etc? I think she should have stepped down but a more balanced story about this MP would have been better (imho). At least she didn’t have a hoarde of priceless artwork stuck in the garage! There was a line of duty with mr gil and mr roca as well as the junta de andalucia ignored the need for houses for a very long time. While doing so, they filled their pockets big time. But as far as I know there were no shots fired which is rather amazing when one reads about the amounts involved. The shots that were fired came, sorry, from the liverpool mafia. Nikki brach, nueva andalucia. There are naughty boys and girls everywhere. Probably she was not happy with the publicity. But the formal value of house of commons notepaper, or wall paper or toilet paper in Spain is zero. It hasno additional meaning here. Maybe she just ran out of toilet paper? when it appears she HAD misused the paper. The word formal is a legal term. Has nothing to do with money. If the note was written on stationary of the parliament of zimbabe, it would have the same meaning in spain: nothing. 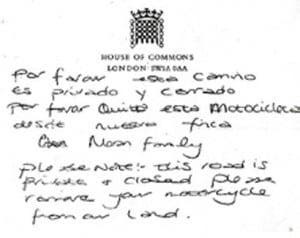 Any spaniard would laugh his head off with such a note. Any intelligent brits around to confirm? Roger, I think that you and everyone at the OP have done a well-balanced story on this “Champagne Socialist” and to think Blair called her a “Babe”? He must have been 3 sheets to the wind and wearing dark glasses that night? Anyway, to F and Fred I don’t think there is ANY vendetta going on here and the only reason this “bruja” used House of Commons note paper to write her diktats on was to deliberately intimidate anyone they were directed at. As for whether she was or wasn’t a good,hard working MP, WHAT THE HELL HAS THAT GOT TO DO WITH THIS STORY apart from nothing? Can you imagine the outcry SHE would cause IF a TORY LANDOWNER barred a PUBLIC RIGHT OF WAY in England? And the last time I saw a face like hers was on Myra Hindley! Right of way is not a public right. The only thing right of way provides is access to other land over private land for land that is not directly connected to a public road. But that does not make the path public, the land remains private, the owner should simply allow others to cross his or her land to reach other land that otherwise could not be reached. Right of way gives the right to cross, not to park a car or motorcycle. Anyone inelligent around to confirm this? F, some rights of way are public. Vias Pecuarias in all their forms (cañadas, veredas, descansaderos etc) are very much public. You are perfectly entitled to park your car/motorbike on them, hunt a rabbit, gather some snails, light a fire, cook a paella… whatever you like. Paul you and I are wasting our time ‘F’ still hasn’t got the point yet!! How hard she worked is not the point. How hard she worked at being manipulative using her position granted in another, different country is interesting. How hard she worked at gagging her misdemeanour’s is enlightening. How hard she tried to cover up her expenses deception from the scrutiny of the British people, which in this case is akin to fraud and embezzlement, is really where the story lies. That she put the Spanish lawyer’s bill into her UK MP’s expense claim underscores the fact that playing fast and loose with the law is habitual with her. That this is obviously a pattern of behaviour with her probably means that Scotland Yard has an interest – this story may play out further. I had always understood claiming money to which you were not entitled could be called fraud, but there seem to be so many of them (MP’s that is) doing it that it is probably unlikely anyone will be charged as there are too many of them. As to the use of House of Commons paper it just goes to show how much it all went to her head. I know I for one wouldn’t be intimidated by it but many probably would be.